I recently got back from Scott Air Force Base in Missouri. I was totally pleased to learn that the commander was interested in creating greater resiliency for his Airmen. So my job was to do just that…but in a very funny way of course. We had a blast… Thanks Scott! Thanks Col. Hornachek! 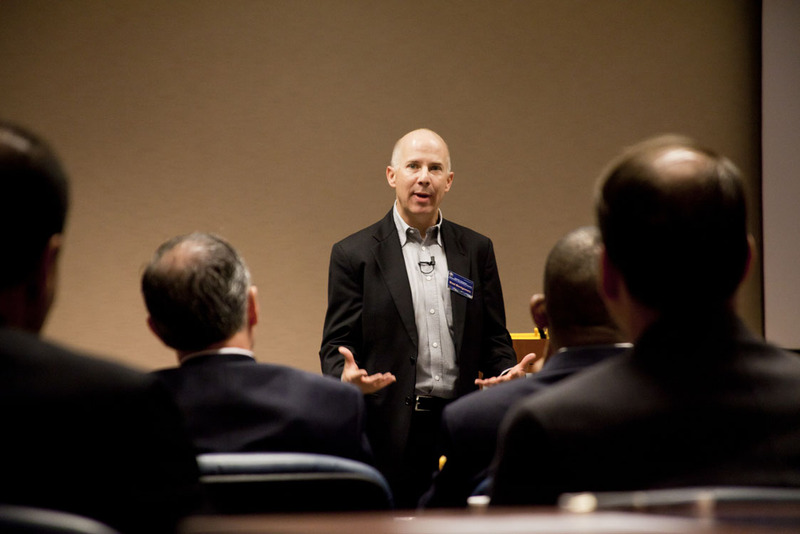 Looking for a motivational speaker or military speaker for your event? Contact me here. Looking for a motivational speaker for your event? <a href=”https://www.bradmontgomery.com/contact”>Contact me here</a>. Speaker; total blast. They had me do three different sessions; it was sort of like a teacher in service, but they had everybody there, classified and non-classified staff. It was a blast and the cool thing it went well, so let’s listen to see what my client Fred had to say about it. Fred: Hey I’m Fred Laudadio, and I am the Director of Learning and Technology for McHenry school district 15. We used Brad Montgomery for our opening day, and our school district is eight schools; 5,000 students and about 500 staff members. So, Brad did an excellent job. He made people laugh until they cried and people just truly enjoyed his humor and his magic. In making the decision to choose Brad, it really came down to who would be the best fit for our school district and truly somebody with a vision, but also that uses humor that is important to a lot of people. And we took a risk, because in previous years, the speakers we were able to go watch personally before we chose them and with Brad he was actually across the country, I believe in Mexico with his family at the time, and so we did a lot of work over the phone and we also called a couple of other school districts that he presented at. And to no regret, Brad was phenomenal and I would recommend to anyone for educational presentation or any business presentation. So thank you very much. Brad: No, thank you. You said something that you’re already getting feedback, electronic feedback, personal feedback, can you speak to that? Fred: Yes, it’s only been about a half an hour since Brad spoke and we’ve gotten e-mails from teachers, we’ve had administrators already approach us, we’ve had even our Superintendent say to previous years’ speakers, we honestly don’t know how you can match one speaker from one year to the next, and you know, Brad has met the challenge to the tenth degree. So everyone was very pleased and feedback is coming in via e-mail and even face-to-face from a lot of people. So, whoo hoo. Brad: And one more thing, you took advantage and I thought were smart, to have me do multiple sessions. Tell them what we did and how did it work. Fred: Sure. This is our big opening day and so what we do is we meet with all of the certified staff, teachers, secretaries, any classification meets and so that is a huge presentation. And so that is what we did first today and that was about an hour and fifteen minutes long and Brad completely nailed it which was fantastic. Then, we met and we did something different this year and that was because Brad was flexible and agreed to that, was we took our administrative staff and we brought them into the learning center, and we have about 35 to 40 of them on our team, and Brad gave them a message personalized just for them and tailored to what we as leaders need to do as an inspiration for the people that work underneath us and that’s at all levels, from both a central office level and a school level. And lastly we met with the food service team for the school district. A team that not necessarily has ever gotten somebody to come and speak to them and motivate them; a particular team that has a lot of turnover and a group that needs motivation. And so Brad came in and was able to speak with them and gave them a message that they were able to walk away with and even just five minutes ago we’ve had three or four food service people come up and thank him for the message that he gave them. So three completely different crowds and three very inspired groups of people. Brad: **** as that, but one of the things that I wanted you to notice from Fred is that if you’re booking an education speaker, you might want to think about using me, taking advantage of me in a good way, the same way Fred did. 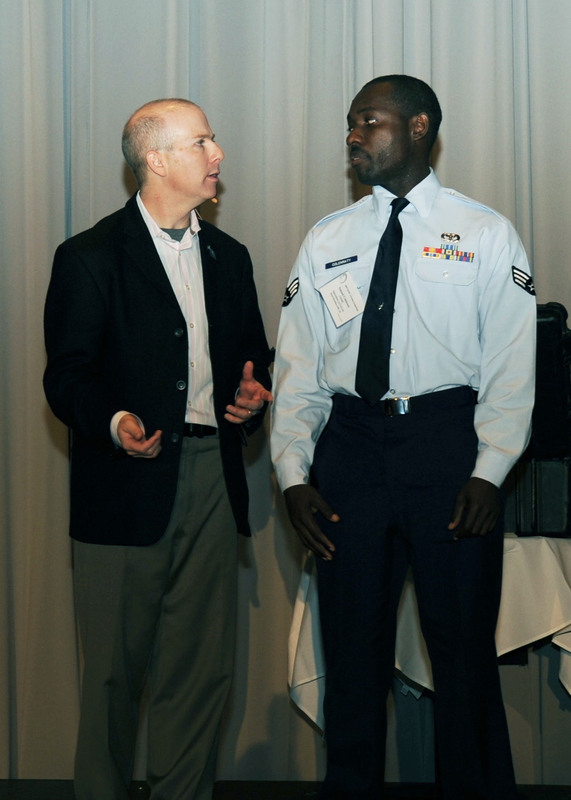 So, he had me do a key note speech for all of his educators, for classified and non-classified staff. And then we followed that with that deal for the leaders, and that was a really cool moment where we took the administrators, put them in a small group, and then we shaped the message and kind of reminded them specifically as leaders how does this message apply to you. How can you use levity and lightheartedness and happiness and joy to make sure that your job as an administrator is, you know, that you’re running at full speed. And finally, how cool was it that he separated the nutrition folks, you know, they were lunch ladies. They were surprised, totally surprised to have a speaker come in for them, and it was also fun, because they were really quiet, but in the end it was clear that that was a great investment of time and fun. So, if you’re looking for a speaker to come speak to your school district, or your schools, if you’re looking for an educator speaker that’s funny and can still make it relevant, I’d love to be your to be your guy. 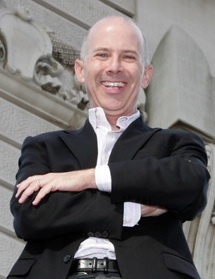 Come visit at BradMontgomery.com. Thanks. Yup. And I have proof. 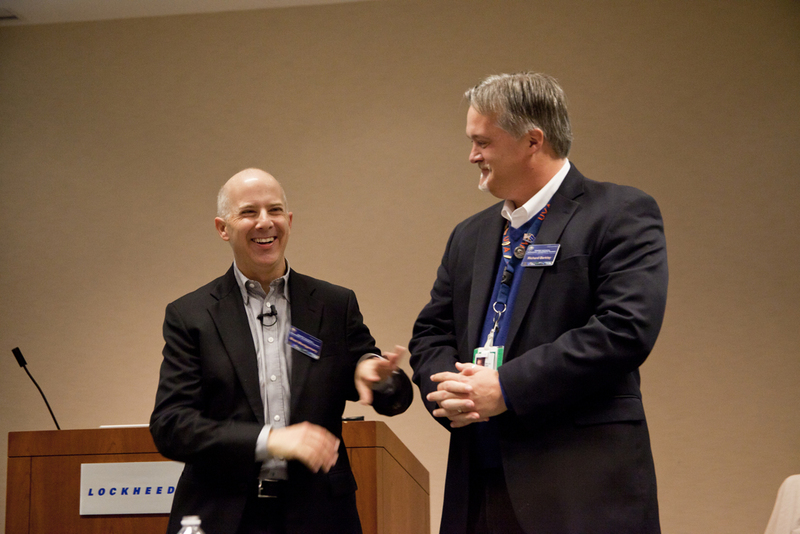 Check out these two photos taken about 2 minutes apart at a recent event at Lockheed in Washington DC. Looking for a funny business speaker for your event? Contact me here. I love being a motivational speaker. But honestly, there are some jobs that are more fun than others. And for me, that often means military audiences. 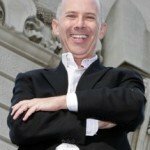 (Hey corporate and association pals… I love you too! But you got to admit it: the military is special.) 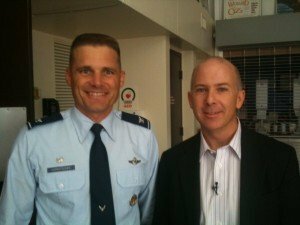 If you’re looking for a military speaker you want to make sure they are good; check out this video from an Air Force event I did…. Speaker: And in all of the years that we have done this, this was the absolute top event and over the top, hit the message right on. Brad: The point is that tiny, tiny changes when added together can make a huge difference. 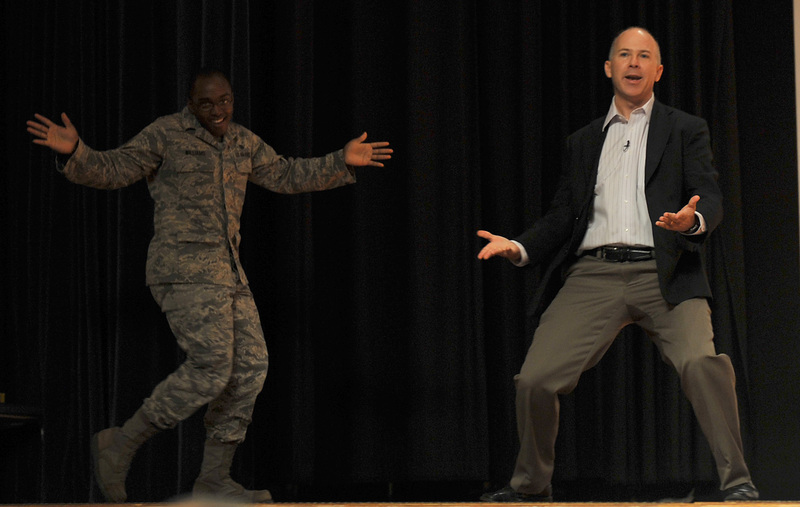 I love being a motivational speaker; but being a motivational speaker for the Air Force is very, VERY cool. I recently spoke at Scott Air Force Base in Missouri. 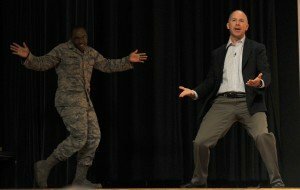 Their commander wanted a funny speaker to speak on resilience and attitude. I was thrilled to be invited. 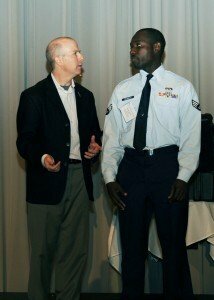 Looking for a motivational speaker or military speaker for your event? <a href=”https://www.bradmontgomery.com/contact”>Contact me here</a>. that theatre, it’s theatre, it doesn’t look like a theatre, but it’s a theatre and there’s going to be a whole bunch of airmen in there; there’s going to be some Marines, National Guard; there might be Navy, might be Coast Guard; everyone is here at Scott. And my job is go and motivate these guys that have been busting their hump, they’re working hard, and happily their Commander really thinks it’s important for them to work on resilience and making sure that the rest of their life is in line with their mission. So wish me luck. A blast! We just left the base. Oh man, two programs we did, two key notes for these military audiences. Really love being a motivational speaker. My corporate clients, I love you; association clients I love you too; government clients, I love you, but okay, forgive me. There’s something really cool about being a military speaker, because this is a group that just works so hard and some of them are just back from deployment, they’re preparing for deployment. They have these super, incredible, important, detail rich jobs and then to stand in front of them and to be able to celebrate their success, to talk about resiliency, to motivate them, to appreciate them, and just to be a part of that for just a little bit is just a cool job. So, Scott Air Force Base you rock. Thanks for making me a part of your team if it was only just for the day and cheers to you. As a motivational speaker I often speak on contacting happiness to bottom line success. Turns out that all we really need is a light heart and a trip to 7-11. 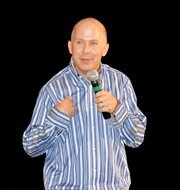 Looking for a motivational speaker or happiness speaker for your event? Contact me here. 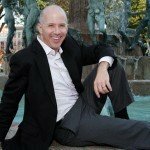 Brad Montgomery from BradMontgomery.com with a message for you about what are you going to do today to make your day better. So, I did something really cool that I sort of did by accident. I used to do it pretty frequently and I kind of forgot about it, but the bottom line is I bought two people a cup of coffee, which doesn’t sound that fun, but it was. So, I’m on my way to a job and I stopped by 711 for a cup of coffee, because I have high standards, and I’m pouring my coffee and there’s these two Mexicans come in and they’re getting coffee. And I talked to them in English, but they’re speaking Spanish to each other and if you don’t know this, I lived in Mexico last year, so I have this really deep bond with just all things Mexican, because when we were in Mexico, I’m telling you countless Mexicans went way out of their way to be generous to me and to my kids, my wife, and to my family. So, I’m thinking of that and I’m kind of too shy to speak Spanish to them and whatever. So then I get up there and I greet them, you know, in English, and I get up there to pay for my coffee and I just figured, oh I want to pay for those guys. There’s two guys over there getting coffee, when they get up here make it free and don’t tell them who did it, just tell them that somebody bought their coffee and to have a good day. And I’m wondering if they speak English, because they clearly, you know they were speaking Spanish to each other. Anyway, so I taught her how to say have a good day” in case they didn’t know and I felt great about it and the cashier got a big grin on her face, because I think she felt like oh, cool I’m going to be part of something fun. And I walk out of the door yelling to myself that was fun, and when I turn back the cahier still had a big grin on her face. So, sometime after I left those guys walked up and got a free cup of coffee and guess what, it made me feel good. Hopefully, it made their day good, but mostly it made me feel great and it was kind of a great way to pay it forward, and it only cost me like $2.50 or something ridiculous. So, what am I saying? I’m saying take responsibility for making your day good. Find stuff to physically do to make you day good and I was reminded today that one good idea is to buy some stranger a cup of coffee. Alright, Brad Montgomery, BradMontgomery.com, if you’re looking for a speaker, a motivational speaker, or a presenter to speech a key note or seminar for you or your organization about levity and lightheartedness and how to bring that into the workplace, I’d love to be your guy, and I’ll even buy you a cup of coffee. Have a great day. Years ago I used to do a ton of elementary school assemblies. I was in my 20’s, and I combined being a magician with a literacy message to create my version of the Magic of Books. Thanks kids. You absolutely made my day. school assembly provider? Contact me here. Hey it’s Brad Montgomery from BradMontgomery.com. I just finished doing the Rolling Creek Elementary School (it was a school assembly) in Elizabeth, Colorado. I’ve got to say, I don’t do that many, I used to do a zillion assemblies, hundreds a year, but now I do like maybe one every other month and I’ve got to say if I had more time, I’d do more, because oh they’re fun. I forgot how much fun those kids are. You know, I do way more magic for the kids then I do at my adult motivational programs, and the kids they just have this energy and this crazy buzz about them that is irresistible and honestly even the bad kids, the kids that are just borderline misbehaving, have such a great energy. They’re not misbehaving because they are bad kids, they’re just misbehaving because they’re excited and they’re jazzed and they’re laughing and whatever, and so that’s really cool. So, the other thing that I thought was interesting is when I was doing this before, when I was doing it for a living, you know when I was doing hundreds a year, I was younger. I didn’t have kids. I didn’t know as much as I know now and now here I am with three kids. My youngest is in her last year of elementary school. I was a foster dad last year. I just feel like I totally get kids in a different way. I just cherish them and I don’t know, I just have a much greater sense of their deep need to be pushed to do amazing things, and it’s just special to be a part of it. So, maybe that sounds cheesy, but I don’t care, because it’s true. I love all of my audiences. Honestly, I love my job, but there’s some audiences that are really cool and there was something really cool today about working for little kids who just haven’t had enough access to adults coming in and looking them in the eye and saying hey, this stuff is important, reading is important, you’re important. If you want to have as much power as you have potential for, if you want to be as good as you can be, it’s going to take reading, so get out there and start. It was cool and then, you know we did like a million magic tricks and I made them laugh and I clowned and it was whatever. It was a good day. The magic of books; that was fun. Thanks very much Rolling Creek Elementary School, I was glad to be part of your team. If you’re looking for an elementary school assembly, this is a literacy assembly, I don’t do very many of them; I don’t have time on the calendar, but if you’re in Colorado definitely give us a call, we’ll see if we can make it work and yeah, thanks. Have a great day. https://www.bradmontgomery.com/wp-content/uploads/2018/11/logo-1-495x198-1-300x120.png 0 0 admin https://www.bradmontgomery.com/wp-content/uploads/2018/11/logo-1-495x198-1-300x120.png admin2011-11-05 20:09:012015-07-08 17:15:51School Assemblies: Sometimes.